1 ft. 3 ft. eqesudxuyaxaxeey 6 ft. 10 ft. 12 ft. 15 ft. 25 ft. The 3' Standard PC Power Cord by Comprehensive is a replacement power cable for your PC, monitor, printer, scanner and most any other device that uses the 3-pin shroud power connector. The cord features a fully molded design providing maximum flexibility and long-lasting durability and is backed by Comprehensive's limited lifetime warranty. 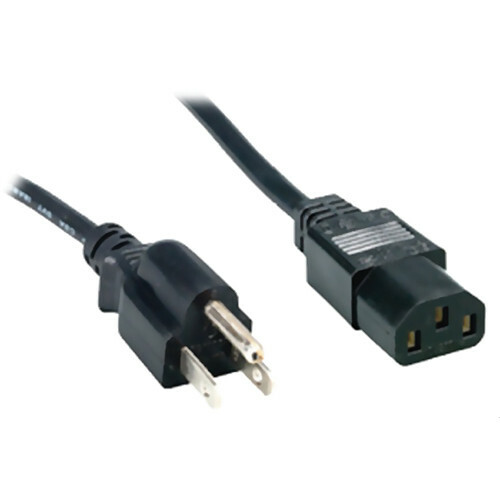 Box Dimensions (LxWxH) 9.0 x 2.5 x 0.2"
Standard PC Power Cord - 3' is rated 3.5 out of 5 by 2. Rated 2 out of 5 by Gerik from Not a Snug Fit I bought this to power the Blackmagic Design HyperDeck Studio Mini, which was a suggested accessary. However, when plugging into the BMD HyperDeck Studio Mini it was not a snug fit and a little wiggle of the cord would cause the HyperDeck to power off.